Traditional Aikido training is the core of our dojo. 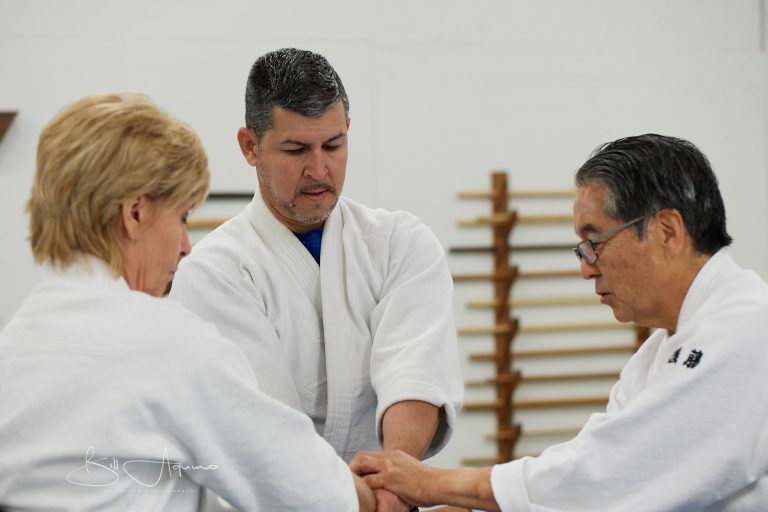 Martial arts can only be learned by direct, person-to-person transmission, and we strive to transmit Aikido as we have learned it: with the mutual respect, compassion, and effectiveness that comes from practice. Our practice teaches mindfulness, the basics of movement and body mechanics, and progresses to being able to respond in real time to a wide variety of attacks. Aikido Kids experience discipline, empathy, empowerment. Our classes allow safe practice of how to connect with others, find your voice, and use the energy that others give you to resolve problems. Students as young as four may learn Aikido, supported by more experienced students (which may include parents and older siblings). Youths ages ten and up have the option to train at an intermediate level, in a class of their peers. Skilled Aikido practitioners often maintain a daily practice well into their 80's. Yet the way in which they practice always changes with time. We must respect our bodies and train in a way that supports health and growth while developing effective skills. We are committed to the vision that anyone can train and develop self-mastery through Aikido. No-Fall classes are open to all dojo members who'd enjoy a noon training hour, are recovering from injury, or simply want to improve their ability to move with a relaxed and centered body. Our dojo hosts a variety of events related to Aikido, health and wellness, other Japanese arts, and self-defense. We invite you to try a class before you join the dojo. In your free trial class, you will meet other students, see Aikido in action, and learn a few basic moves. A dojo member will be available to answer your questions and make sure you have the information and experience you need to decide if Aikido training is right for you.